The template report provides the operator with a wealth of information regarding the templates available to a particular job. The report shows exactly which templates a job is 'seeing' in the currently open program and will alert the user to problems associated with these templates. As such it is a valuable tool to assist in managing a job's templates and troubleshooting issues. 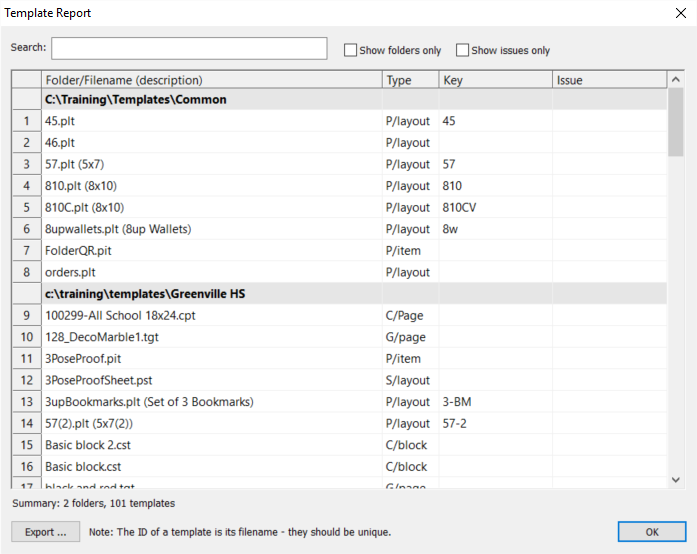 The report only lists templates that are appropriate for the program currently open. For example running the report in NeoComposite will only list composite page templates, subject block templates and board templates (.cpt, .cst, .cbt) whereas running the report in NeoGroup only lists group templates (.tgt). Since version 4.6 of NeoPackProfessional now supports composites and groups it is 'aware' of those programs' templates as well as its own templates. For this reason running the report in NeoPackProfessional yields the most information. At a minimum the template report in NeoPackProfessional gives the operator a count of the number of templates the job is accessing. Since the time taken for a job to open (and other performance criteria when working with a job) is dependant on the number of templates the job must 'read', the report is useful in assessing whether a job is unnecessarily loading more templates than needed. The total number of templates the job is reading can be found at the bottom of the Template Report window. Figure 2: This job is loading 101 templates in two different folders. Hint!. To hide all the templates so only the paths are visible, select the 'Show folders only' filter at the top of the report window. The main portion of the report lists the full template name including extension. If the template has been given a description it is displayed in parentheses. For a given job, template keys should be unique. At time of writing, the Issue column reports two issues. It is foreseen this will expand in the future, reporting on other issues to do with templates. Hint! To display only templates with issues use the 'Show issues only' filter at the top of the report window. This is very useful when there are a large number of templates and it is not possible to see all issues without scrolling the list. It is possible to automatically open a template in the currently open program's template designer by simply double clicking the template. This is particularly useful when trobleshooting and fixing an issue as described above. 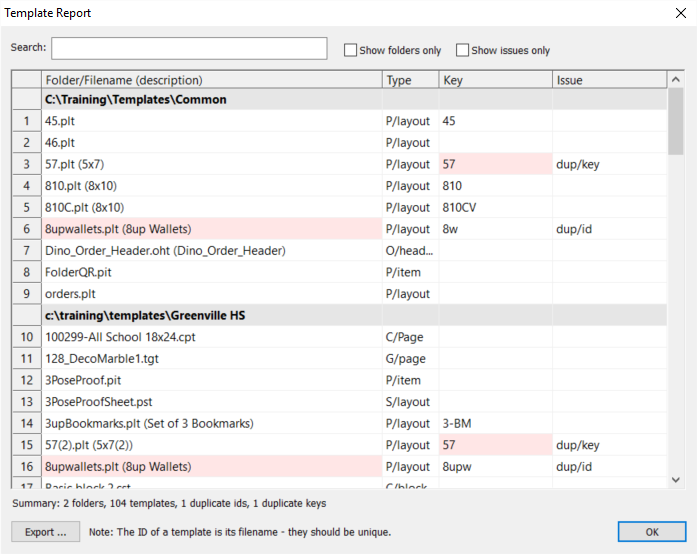 Although the template report in NeoPackProfessional lists (almost) all template types, its template designer can only open pack layouts and pack item templates. It is not possible, for example, to open a composite page layout from within NeoPack's template report.